“New York Times bestselling author David Levithan tells the based-on-true-events story of Harry and Craig, two 17-year-olds who are about to take part in a 32-hour marathon of kissing to set a new Guinness World Record—all of which is narrated by a Greek Chorus of the generation of gay men lost to AIDS. Two Boys Kissing is a book that takes a controversial subject matter and casts a new, hopeful light on it. It’s a book that drives a stake of understanding, compassion and feeling into the heart of the reader. It’s a book that makes people stop and think in a different way. It’s a book that has the power to change minds–hearts–lives. Two Boys Kissing is more than a story about two boys kissing. It’s a story about love. And life. And appreciating love and life. “There is the sudden. There is the eventual. And in between, there is the living.” Gay or straight, we all journey through life experiencing many of the same things: joy and heartache, bravery and fear, acceptance and rejection, triumph and failure, love and hate, past and future, noise and silence, light and dark, ups and downs…We are all human. We are all alive. And we should appreciate that very basic, wondrous fact. No matter who you are, you are alive. You are here. Read more about Two Boys Kissing here. “A breathtaking journey toward self-discovery and true love, from the author of If I Stay. Once again, Gayle Forman delivers! This is a book I’ve been meaning to read all year long, and I finally got around to it. Thank goodness, too! Just One Day was wonderful. It’s more than a tale about lost love. It’s about finding oneself, too. It’s about how one day can change your life–how one day can change you. Shells can be broken, fears obliterated, and personal identities transformed. You can go from being weak to strong, scared to brave, cookie cutter to unique. I’m already on the waiting list at the library for Just One Day’s sequel, Just One Year. And I can’t wait to read it! Read more about Just One Day here! A couple of weeks ago, I wrote a confession about how I’m a HUGE fan of authors. To me, they’re cooler than cool and bigger than any rockstar, movie actor or professional athlete. They’re also one of my biggest role models. As an aspiring author myself, I look up to these writers and hope to someday follow in their successful footsteps. (In case you missed it, here is my original post about this “Ah!” topic). Yesterday, I had another “EEEEKS!” moment I had to share with you. 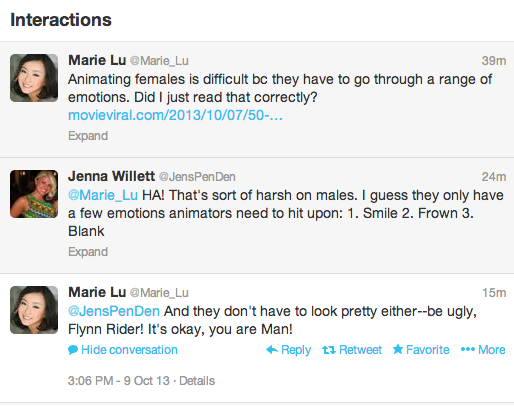 During a mental break at work, I went on Twitter and decided to reply to a funny Tweet made by Marie Lu. And guess what? SHE REPLIED! Needless to say, I almost had a heart attack at my desk. Smothering my gleeful scream of “Ohmygawd”, I text a good friend who’s also a big fan of Marie Lu. Who knew Twitter could be such a magical place? I think I’m going to start keeping an “Ah! They Responded!” list from now on. Yeah? 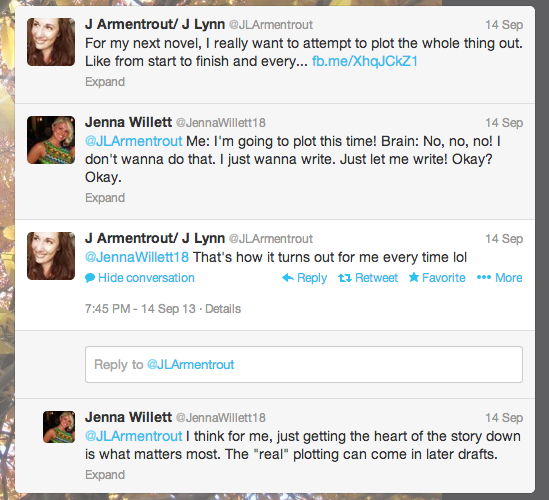 So far, that list contains Jay Asher, Jennifer L. Armentrout and Marie Lu. Don’t forget, Champion, the finale to Marie Lu’s Legend series, is set to be released on November 5th! “This National Book Award Finalist is now a major motion picture — one of the most buzzed-about films at Sundance 2013, starring Shailene Woodley and Miles Teller. Sorry, sorry. I couldn’t resist. But, really, The Spectacular Now was “fabuloso”. It lived up to all the hype of the recent media, and definitely lived up to my expectations. Author Tim Tharp infused a perfect blend of humor and drama, and created characters that were not only believable, but relatable. It’s one of those books that’s layered with hidden meanings and themes, and keeps you thinking about what those meanings and themes are the entire time. And, despite his downfalls and bad habits, you can’t help but want to experience the magic and wonder of the “Spectacular Now” with Sutter Keely, even if only for a moment. My only complaint about this book would be the ending (don’t worry, I’m not going to spoil it for you; I despise spoilers!). I won’t say I was disappointed, per se. More like, “Hmm…”. I just can’t grasp why Tim Tharp finished Sutter Keely’s tale the way he did. However, I know there is a profound reason that’s eluding me at the moment, and I know if I went back and re-read it or discussed it with others who’ve read it, I’d get it and appreciate it. So, don’t let this part of my review scare you off from reading what was otherwise a wonderful book. If you enjoyed YA contemporaries like Why We Broke Up, The Fault in our Stars, and The Perks of Being a Wallflower, then chances are you’ll enjoy The Spectacular Now. Read more about The Spectacular Now here. Forget rockstars. Forget actors. Forget pro athletes and supermodels. Forget all the mega celebrities out there. 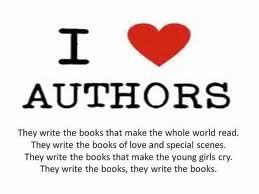 To me, an author is the biggest superstar of them all. And when I capture one’s attention on Twitter? Let me say start out by admitting I’m new to the Twitter scene. I’ve only been on it for a couple of months now and I’m just getting the hang of it (er, sort of). When I first started following all of my favorite authors, I was too scared and/or shy to reply to their Tweets. 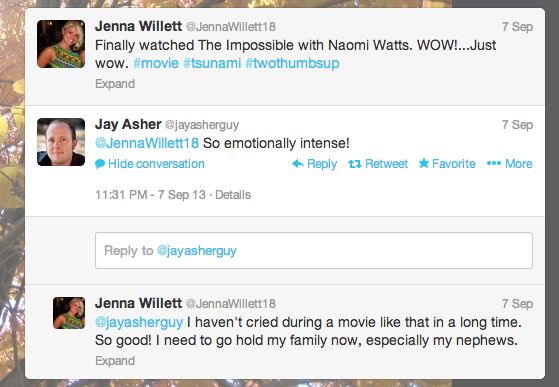 Then I took the plunge and nervously started hitting the “Reply” and “Favorite” buttons. My expectations for a response or acknowledgment of any kind were low. Honestly, they still are. Authors are popular and busy. They can’t reply to everyone. However, I have received a few responses (as seen in the evidence below, thank you very much!). Of course, nobody in my personal life understands these giggly, gushing, borderline fanatical responses of mine. They look at me like I’m a mysterious specimen that comes from another planet. Whatever, I don’t care! As a genuine lover of books and an aspiring author myself these Tweets are precious to me and keep me smiling for days and days.